The biggest sale of the year has finally arrived and is open to the public starting TOMORROW! Nordstrom is my absolute favorite place to shop because of their large variety of product offerings in all price ranges. Everything I've purchased from Nordstrom has been such high quality and I have never once been disappointed. The best part about shopping here (in my opinion) is that they offer free shipping and returns! The anniversary sale is my favorite because they offer huge discounts on brand new items that will be around all season long. That being said, now is the time to stock up on all your fall essentials. I have linked all of my favorites below by category! BP. Raw Edge V-Neck Tee : True-to-size, wearing a size small, perfect for layering! Halogen® Long Open Front Cardigan : TTS, I sized up and am wearing a medium. Steve Madden Brinkley Over the Knee Stretch Boot : TTS, wearing an 8.5, Stuart Weitzman look alikes for under $100!! Leith Ribbed Shawl Cocoon Sweater : TTS, wearing a small, SO SOFT! Lucky Brand Yabba Wedge Bootie : TTS, wearing an 8.5, the wedge makes these so cute. Wearing the gray color! Free People Saturday Morning Cardigan: TTS, wearing a S/M. Chelsea28 Oversize Open Cardigan : Runs large, size down! BP. Ribbed V-Neck Tee : TTS, wearing a small. Perfect staple piece for fall! Free People Found My Friend Sweater : TTS, wearing a small, size down if you want it more fitted. My favorite item I've tried on so far!! So soft and the prettiest periwinkle color. SPANX® Faux Leather Leggings : TTS, wearing a small. Hug you in all the right places!!! So comfortable. If you buy one piece in this sale, let this be it! BP. Varsity Stripe Sweater : Runs small, I sized up to a large! T3 Hairdyer: I've heard AMAZING things about this dyer and can't wait to try it out!! Luggage Set : I've been eyeing this set for about a year now. It finally went on major sale and I decided to snag it! Can't wait to use these.. So cute!! Also come in black. Now for the fun stuff!! SURPRISE! To celebrate the Nordstrom Anniversary Sale officially being released to the public... 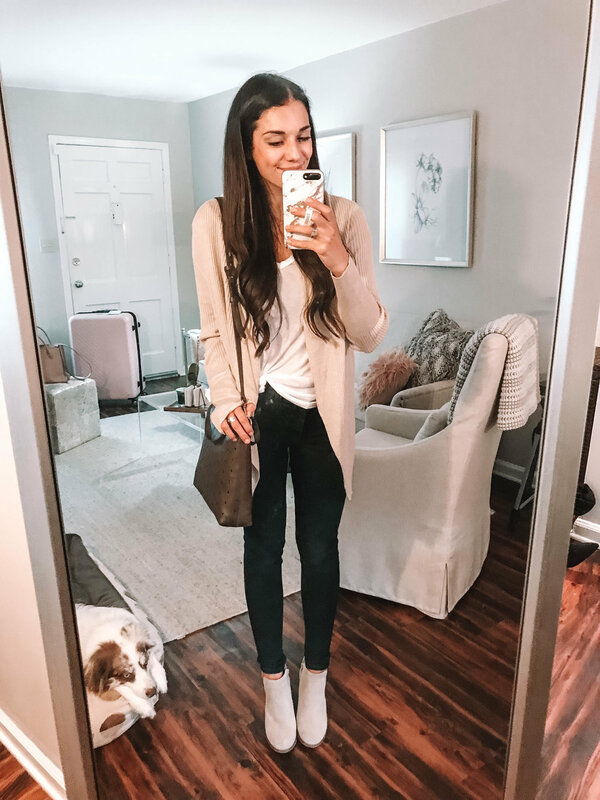 I am giving away a $75 Nordstrom giftcard to one lucky winner! The winner will be announced on the morning of July 27th. That way, you will still have plenty of time to shop (the N-sale goes until August 5th)! This giveaway is to say thank you for all the love and support you've shown Carlyle Thornton Blog!